Tanzania is a nation in east Africa. Its area is 362,162 square miles (883,749 km2) and it has a population (2000) of 32.1 million. The capital city is Dodoma, but the main city and commercial centre is Dar es Salaam. Tanzania comprises the territory of Tanganyika, a former German colony which was mandated to the United Kingdom after the First World War, and the former British colony of Zanzibar. Tanganyika gained independence in 1961 and Zanzibar in 1963; the two states merged to form Tanzania on 16 April 1964. Population distribution in Tanzania is extremely uneven. Density varies from 3 persons per square mile (1 per km2.) in arid regions to 133 per square mile (51 per km2.) in the mainland's well-watered highlands to 347 per square mile (134 per km2.) on Zanzibar. More than 80% of the population is rural. Dar es Salaam is the capital and largest city; Dodoma, located in the center of Tanzania, has been designated the legislative capital and the Parliament meets there four times a year. The African population consists of more than 120 ethnic groups, of which the Sukuma, Haya, Nyakyusa, Nyamwezi, and Chaga have more than 1 million members each. The majority of Tanzanians, including such large tribes as the Sukuma and the Nyamwezi, are of Bantu stock. Groups of Nilotic or related origin include the nomadic Masai and the Luo, both of which are found in greater numbers in neighboring Kenya. Two small groups speak languages of the Khoisan family peculiar to the Bushman and Hottentot peoples. Cushitic-speaking peoples, originally from the Ethiopian highlands, reside in a few areas of Tanzania. Although much of Zanzibar's African population came from the mainland, one group known as Shirazis traces its origins to the island's early Persian settlers. Non-Africans residing on the mainland and Zanzibar account for 1% of the total population. The Asian community, including Hindus, Sikhs, Shi'a and Sunni Muslims, and Goans, has declined by 50% in the past decade to 50,000 on the mainland and 4,000 on Zanzibar. An estimated 70,000 Arabs and 10,000 Europeans reside in Tanzania. Each ethnic group has its own language, but the national language is Kiswahili, a Bantu-based tongue with strong Arabic borrowings. Population: Mainland—39.3 million. Zanzibar—1 million (est.). Religions: Muslim 40%, Christian 40%, indigenous beliefs 20%. Education: Attendance—73.2% Mainland (primary); 71.4% Zanzibar. Literacy: Females 67% Mainland; 76.8% Zanzibar. Literacy: Males 79.9% Mainland; 86% Zanzibar. Health: Infant mortality rate—68/1,000. Life expectancy—50 years. Work force: Agriculture—80%; industry, commerce, government—20%. Tanzania's president and National Assembly members are elected concurrently by direct popular vote for 5-year terms. The president appoints a prime minister who serves as the government's leader in the National Assembly. The president selects his cabinet from among National Assembly members. The Constitution also empowers him to nominate 10 non-elected members of Parliament, who also are eligible to become cabinet members. Elections for president and all National Assembly seats were held in December 2005. The unicameral National Assembly has up to 325 members: the Attorney General, the Speaker, five members elected from the Zanzibar House of Representatives to participate in the Parliament, 75 special women's seats apportioned among the political parties based on their election results, 233 constituent seats from the mainland, and up to 10 members nominated by the president. In 2006, the president nominated seven members and the Speaker was elected to a constituent seat, bringing the total number of Members of Parliament to 320. The ruling party, CCM, holds about 82% of the seats in the Assembly. Laws passed by the National Assembly are valid for Zanzibar only in specifically designated union matters. Zanzibar's House of Representatives has jurisdiction over all non-union matters. There are currently 81 members in the House of Representatives in Zanzibar: 50 elected by the people, 10 appointed by the president of Zanzibar, 5 ex officio members, an attorney general appointed by the president, and 15 special seats allocated to women. Ostensibly, Zanzibar's House of Representatives can make laws for Zanzibar without the approval of the union government as long as it does not involve union-designated matters. The terms of office for Zanzibar's president and House of Representatives also are 5 years. The semiautonomous relationship between Zanzibar and the union is a relatively unique system of government. Tanzania has a five-level judiciary combining the jurisdictions of tribal, Islamic, and British common law. Appeal is from the primary courts through the district courts, resident magistrate courts, to the high courts, and the high courts to the Court of Appeals. District and resident court magistrates are appointed by the Chief Justice, except for judges of the High Court and Court of Appeals, who are appointed by the president. The Zanzibari court system parallels the legal system of the union, and all cases tried in Zanzibari courts, except for those involving constitutional issues and Islamic law, can be appealed to the Court of Appeals of the union. A commercial court was established on the mainland in September 1999 as a division of the High Court. For administrative purposes, Tanzania is divided into 26 regions—21 on the mainland, 3 on Zanzibar, and 2 on Pemba. Ninety-nine district councils have been created to further increase local authority. These districts are also now referred to as local government authorities. Currently there are 114 councils operating in 99 districts, 22 are urban and 92 are rural. The 22 urban units are classified further as city (Dar es Salaam and Mwanza), municipal (Arusha, Dodoma, Iringa, Kilimanjaro, Mbeya, Morogoro, Shinyanga, Tabora, and Tanga), and town councils (the remaining 11 communities). From independence in 1961 until the mid-1980s, Tanzania was a one-party state, with a socialist model of economic development. Beginning in the mid-1980s, under the administration of President Ali Hassan Mwinyi, Tanzania undertook a number of political and economic reforms. In January and February 1992, the government decided to adopt multiparty democracy. Legal and constitutional changes led to the registration of 11 political parties. Two parliamentary by-elections (won by CCM) in early 1994 were the first-ever multiparty elections in Tanzanian history. In October 2000, Tanzania held its second multi-party general elections. The ruling CCM party's candidate, Benjamin W. Mkapa, defeated his three main rivals, winning the presidential election with 71% of the vote. In the parliamentary elections, CCM won 202 of the 232 elected seats. In the Zanzibar presidential election, Abeid Amani Karume, the son of former President Abeid Karume, defeated CUF candidate Seif Sharif Hamad. The election was marred by irregularities, especially on Zanzibar, and subsequent political violence claimed at least 23 lives in January 2001, mostly on Pemba island. Also, 16 CUF members were expelled from the Union Parliament after boycotting the legislature to protest the Zanzibar election results. In October 2001, the CCM and the CUF parties signed a reconciliation agreement which called for electoral reforms on Zanzibar and set up a Commission of Inquiry to investigate the deaths that occurred in January 2001 on Pemba. The agreement also led to the presidential appointment of an additional CUF official to become a member of the Union Parliament. Changes to the Zanzibar Constitution in April 2002 allowed both the CCM and CUF parties to nominate members to the Zanzibar Electoral Commission. In May 2003, the Zanzibar Electoral Commission conducted by-elections to fill vacant seats in the parliament, including those seats vacated by the CUF boycott. Observers considered these by-elections, the first major test of the reconciliation agreement, to be free, fair, and peaceful. In October 2005, presidential and parliamentary elections were scheduled to take place. However, the death of an opposition vice presidential candidate forced a postponement until December. Zanzibari presidential elections went forward as scheduled. Although there were many administrative improvements over the 2000 elections in Zanzibar, the poll was marred by violence and intimidation. Abeid Amani Karume edged out Seif Sharif Hamad 53% to 46% in an election widely deemed to have had serious irregularities by international observers. In contrast, the December 2005 elections in mainland Tanzania proceeded with few if any problems, and the popular Kikwete won by over 80% of the vote. The ruling CCM party also picked up additional parliamentary seats, leaving the opposition parties fractured and marginalized. President Kikwete, Vice President Ali Mohamed Shein, Prime Minister Edward Lowassa, and National Assembly members will serve until the next general elections in 2010. Similarly, Zanzibar President Karume and members of the Zanzibar House of Representatives also will complete their terms of office in 2010. In 2001, the East African Community (EAC)--formerly a customs union in 1967 consisting of Tanzania, Kenya and Uganda—was revived, and a new treaty was signed that paves the way for an economic and political union of the three countries. In July 2007, Rwanda and Burundi joined the EAC as full members. Tanzania's first president, Julius Nyerere also was one of the founding members of the Non-Aligned Movement, and, during the Cold War era, Tanzania played an important role in regional and international organizations, such as the Non-Aligned Movement, the front-line states, the G-77, and the Organization of African Unity (OAU). One of Africa's best-known elder statesmen, Nyerere was personally active in many of these organizations, and served chairman of the OAU (1984–85) and chairman of six front-line states concerned with eliminating apartheid in Southern Africa. Nyerere's death, in October 1999, is still commemorated annually. Tanzania enjoys good relations with its neighbors in the region and in recent years has been an active participant in efforts to promote the peaceful resolution of disputes. Tanzania helped to broker peace talks to end the conflict in Burundi; a comprehensive cease-fire was signed in Dar es Salaam on September 7, 2006. Tanzania also supports the Lusaka agreement concerning the conflict in the Democratic Republic of the Congo. In March 1996, Tanzania, Uganda, and Kenya revived discussion of economic and regional cooperation. These talks culminated with the signing of an East African Cooperation Treaty in September 1999; a treaty establishing a Customs Union was signed in March 2004. The Customs Union went into effect January 1, 2005 and, in time, should lead to complete economic integration. On July 1, 2007 Rwanda and Burundi joined the EAC and the Customs Union as full members. Tanzania is the only country in East Africa which also is a member of the Southern Africa Development Community (SADC). In January 2005, Tanzania became a non-permanent member of the UN Security Council serving a two-year term that ended on December 31, 2006. A Dhow in the Indian Ocean. The background shows the Zanzibar Island, 2011. Significant measures have been taken to liberalize the Tanzanian economy along market lines and encourage both foreign and domestic private investment. Beginning in 1986, the Government of Tanzania embarked on an adjustment program to dismantle state economic controls and encourage more active participation of the private sector in the economy. The program included a comprehensive package of policies which reduced the budget deficit and improved monetary control, substantially depreciated the overvalued exchange rate, liberalized the trade regime, removed most price controls, eased restrictions on the marketing of food crops, freed interest rates, and initiated a restructuring of the financial sector. Average growth rate (2006): 6.2%. Per capita income (2006): $320. Agriculture (2004): 46.4% of GDP. Products—coffee, cotton, tea, tobacco, cloves, sisal, cashew nuts, maize, livestock, sugar cane, paddy, wheat, pyrethrum. Industry/manufacturing (2004): 8.8% of GDP. Types—textiles, agro-processing, light manufacturing, construction, steel, aluminum, paints, cement, cooking oil, beer, mineral water and soft drinks. Trade (2006): Exports--$1.723 billion (merchandise exports, 2006): coffee, cotton, tea, sisal, cashew nuts, tobacco, cut flowers, seaweed, cloves, fish and fish products, minerals (diamonds, gold, and gemstones), manufactured goods, horticultural products; services (tourism services, communication, construction, insurance, financial, computer, information, government, royalties, personal and other businesses). Major markets—U.K., Germany, India, Japan, Italy, China, Bahrain, Malaysia, South Korea, Thailand, Pakistan, Indonesia. Primary imports—petroleum, consumer goods, machinery and transport equipment, used clothing, chemicals, pharmaceuticals. Major suppliers—U.K., Germany, Japan, India, Italy, U.S., United Arab Emirates, Hong Kong, Singapore, South Africa, Kenya. In July 2003, Tanzania's Poverty Reduction and Growth Facility (PRGF) arrangement with the International Monetary Fund was extended for an additional three years. In June 2003, the Tanzanian Government successfully completed a previous three-year PRGF, the successor program to the Enhanced Structural Adjustment Facility (ESAF). From 1996-1999, Tanzania had an ESAF agreement. Tanzania also embarked on a major restructuring of state-owned enterprises. The program has so far divested 335 out of some 425 parastatal entities. Overall, real economic growth has averaged about 4% a year, much better than the previous 20 years, but not enough to improve the lives of average Tanzanians. Also, the economy remains overwhelmingly donor-dependent. Moreover, Tanzania has an external debt of $7.5 billion. The servicing of this debt absorbs about 40% of total government expenditures. Tanzania has qualified for debt relief under the enhanced Highly Indebted Poor Countries (HIPC) initiative. Debts worth over $6 billion were canceled following implementation of the Paris Club VII Agreement. Agriculture dominates the economy, providing more than 44% of GDP and 80% of employment. Cash crops, including coffee, tea, cotton, cashews, sisal, cloves, and pyrethrum, account for the vast majority of export earnings. While the volume of major crops—both cash and goods marketed through official channels—have increased in recent years, large amounts of produce never reach the market. Poor pricing and unreliable cash flow to farmers continue to frustrate the agricultural sector. Despite Tanzania's past record of political stability, an unattractive investment climate has discouraged foreign investment. Government steps to improve the business climate include redrawing tax codes, floating the exchange rate, licensing foreign banks, and creating an investment promotion center to cut red tape. In terms of mineral resources and the largely untapped tourism sector, Tanzania could become a viable and attractive market for U.S. goods and services. Zanzibar's economy is based primarily on the production of cloves (90% grown on the island of Pemba), the principal foreign exchange earner. Exports have suffered with the downturn in the clove market. Tourism is a promising sector with a number of new hotels and resorts have been built in recent years. The Government of Zanzibar legalized foreign exchange bureaus on the islands before the mainland Tanzania moved to do so. The effect was to increase the availability of consumer commodities. Furthermore, with external funding, the Government of Zanzibar plans to make the port of Zanzibar a free port. In 2007, the rehabilitation of Zanzibar’s port facilities commenced with assistance from European donors. The island's manufacturing sector is limited mainly to import substitution industries, such as cigarettes, shoes, and process agricultural products. In 1992, the government designated two export-producing zones and encouraged the development of offshore financial services. Zanzibar still imports much of its staple requirements, petroleum products, and manufactured articles. German colonial interests were first advanced in 1884. Karl Peters, who formed the Society for German Colonization, concluded a series of treaties by which tribal chiefs in the interior accepted German "protection." Prince Otto von Bismarck's government backed Peters in the subsequent establishment of the German East Africa Company. In 1954, Julius K. Nyerere, a school teacher who was then one of only two Tanganyikans educated abroad at the university level, organized a political party—the Tanganyika African National Union (TANU). TANU-supported candidates were victorious in the Legislative Council elections of September 1958 and February 1959. In December 1959, the United Kingdom agreed to the establishment of internal self-government following general elections to be held in August 1960. Nyerere was named chief minister of the subsequent government. In May 1961, Tanganyika became autonomous, and Nyerere became Prime Minister under a new constitution. Full independence was achieved on December 9, 1961. Julius. Nyerere was elected President when Tanganyika became a republic within the Commonwealth a year after independence. The Arabs established their own garrisons at Zanzibar, Pemba, and Kilwa and carried on a lucrative trade in slaves and ivory. By 1840, Said had transferred his capital from Muscat to Zanzibar and established a ruling Arab elite. The island's commerce fell increasingly into the hands of traders from the Indian subcontinent, who Said encouraged to settle on the island. Zanzibar's political development began in earnest after 1956, when provision was first made for the election of six nongovernmental members to the Legislative Council. Two parties were formed: the Zanzibar Nationalist Party (ZNP), representing the dominant Arab and "Arabized" minority, and the Afro-Shirazi Party (ASP), led by Abeid Karume and representing the Shirazis and the African majority. Zanzibar received its independence from the United Kingdom on December 19, 1963, as a constitutional monarchy under the sultan. On January 12, 1964, the African majority revolted against the sultan and a new government was formed with the ASP leader, Abeid Karume, as President of Zanzibar and Chairman of the Revolutionary Council. Under the terms of its political union with Tanganyika in April 1964, the Zanzibar Government retained considerable local autonomy. On April 26, 1964, Tanganyika united with Zanzibar to form the United Republic of Tanganyika and Zanzibar. 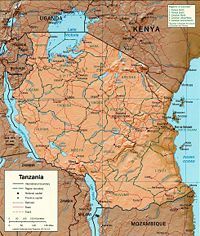 The country was renamed the United Republic of Tanzania on October 29, 1964. To form a sole ruling party in both parts of the union Nyerere merged TANU with the Zanzibar ruling party, the Afro-Shirazi Party (ASP) of Zanzibar to form the CCM (Chama cha Mapinduzi-CCM Revolutionary Party), on February 5, 1977. The CCM was to be the sole instrument for mobilizing and controlling the population in all significant political or economic activities. He envisioned the party as a "two-way street" for the flow of ideas and policy directives between the village level and the government. On April 26, 1977, the union of the two parties was ratified in a new constitution. The merger was reinforced by principles enunciated in the 1982 union constitution and reaffirmed in the constitution of 1984. President Nyerere stepped down from office and was succeeded as President by Ali Hassan Mwinyi in 1985. Nyerere retained his position as Chairman of the ruling CCM party for 5 more years and was influential in Tanzanian politics until his death in October 1999. The current President, Jakaya Kikwete, was elected in December 2005. Zanzibar President Amani Abeid Karume, the son of Zanzibar’s first president, was elected in 2000, in general elections that were marked by widespread irregularities throughout the Isles. His predecessor, Salmin Amour, was first elected in single-party elections in 1990, then re-elected in 1995 in Zanzibar’s first multi-party elections. These elections also were tainted by violence and serious irregularities in the voting process. This page was last modified on 2 September 2016, at 14:28.